This year at OBF I decided to take worst notes and enjoy the fest a little more. So to supplement my description of the beer I have included the breweries description so if my wordsmith-ery does not satisfy your desire for information about the beer you can read what they have to say about it. Overall the this was a great as usual I took of Thursday to got to enjoy the short lines arriving shortly after noon. The first beer I went for was a Floridian beer from Cigar City Brewing. My Notes: Pinkish orange in color with a tart and fruity in flavor really a great beer probably one of my favorite at the fest this year.Light bodied with a lively carbonation and tart finish. Just a fantastic beer not to sour but just tart enough. The Blood Orange is fragrant and very flavorful. Description: Ever sipped juice from a cactus? Try this beer and check that one off your bucket list. Dragon Fruit is actually a member of the cactus family and tastes like a combination of kiwi and pear. Added to the fermentables (Pilsner, pale wheat and acidulated malt) and fermented with a neutral English style yeast, it's kettle-soured with Lactobacillus, then boiled to sterilize and isomerize the low dose of Magnum hops. Tart and fruity in flavor, "Florida Weisse" is its own unique style of beer. My Notes: A clear golden ale with aspares head. More grapefruit rind flavor came thourh that I was expecting. Had a biting bitterness to it. Pamplemousse is of course french for grapefruit. Description: Pamplemousse is a straw-colored, medium-bodied, hop-forward IPA with a big malt backbone contributed by the grist of pale malt, malted wheat, Carastan and a bit of flaked barley. The hop bill includes Tettnanger, Summit, Chinook and Meridian in the boil; it's then dry-hopped with Summit, Chinook and Meridian. Wyeast's classic American ale yeast ferments it clean with some pleasant fruity esters. My Notes: A clear straw colored beer with a crazy coffee flavor. not what you expect coming from such a light beer. Not much other than the espresso beans came through though. Kind of like a light yellow cup of watered down coffee. For being as heavily hopped as this beer was the hops were not very present. Wake up and smell the brewski! This beer is flavored with espresso coffee beans sourced from Berds Beans in Boardman, Oregon. The grist is comprised of two-row, Munich and Vienna malts, and it's hopped with six varieties: Cascade, Chinook, Mosaic, Falconer’s Flight, Simcoe and Summit. A dry-hop dose of Falconer's and Simcoe give it a hoppy finish. My Notes: A hazy peach colored beer tasted like liquid peach pie. The balance of this beer was spot on with the cinnamon and nutmeg with the peaches was great as well as the malt giving the beer a slight "crust" flavor. Definitely a great dessert beer. Description:What makes this beer unique? The addition of peaches and peach juice, honey, cinnamon, nutmeg and milk sugar, on top of a grist (or crust?) of two-row pale, white malted wheat and Vienna malt. It's first-wort hopped with Cascades but only enough to balance the peach-pie sweetness. This would make a great dessert. My Notes: This beer didn't have much going on, basically pureed and pressed raspberry juice with a little beer added. 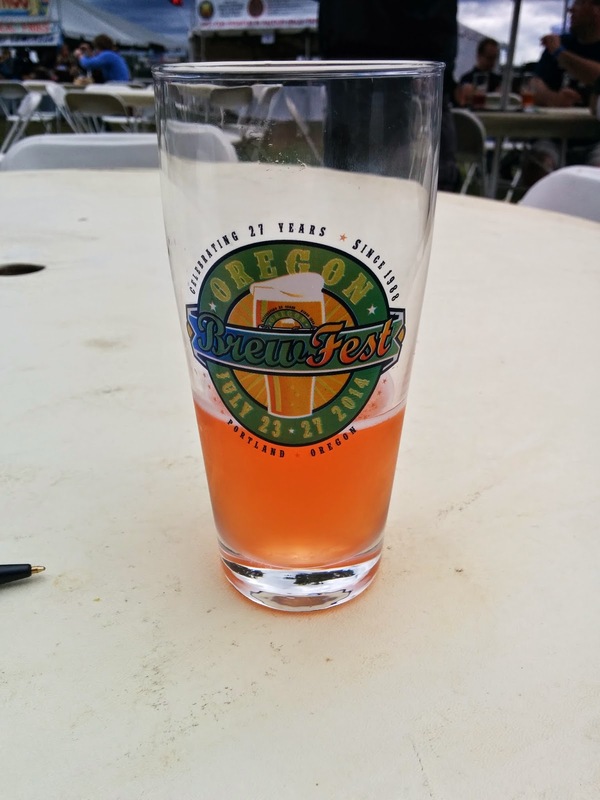 The color was a chunky pink that was alien to me in at a beer fest. Description: Two-row barley malt and raw white wheat form the fruity Belgian-Style base of this low-hop brew. Fermented with a Belgian Wit yeast for an inherent fruity character, the brewers added a low dose of bittering hops as well as orange peel, coriander, Oregon raspberry and Italian plums for flavoring and balance of the malt, while hibiscus flowers add a refreshing tartness. Moderately soft brewing water diminishes the impact of the hops, letting all of those other lovely flavors move forward on your palate. My Notes: While this cloudy amber beer didn't have the literal taste of pie like the Peach Heffy it was pretty good. The lightly sour beer had a good balance of the rhubarb and strawberries. Description: This beer is as American as soccer, boudin blanc sausage, Trabant cars and, well, strawberry rhubarb gose. Strawberries, rhubarb and salt join Pilsner malt and malted wheat and just enough hops to notice that they're there. A sour kettle technique is used to make a tart beer fermented by an ale strain that yields fruity esters on top of the berries. It's strawberry rhubarb pie in a glass. My Notes: Probably my least favorite beer, slightly burning in the back of the throat which wasn't intolerable but just did not taste that good. There wasn't much going on with this beer other than the peppers. Tasted slightly musty. Description: This beer will surprise you. Not a burner at all, it's surprisingly refreshing and drinkable. The broad pungent flavor of jalapeño and serrano peppers ally beautifully with the pear and clove flavors contributed by the Belgian wit yeast. Two-row barley malt and rolled oats provide lots of fermentables – and ferment they do, up to 9% alcohol. Nuggets do a little bit of bittering, and Tettnangers provide hop flavor and aroma, but not so much that you lose the pepper flavors. My Notes: Awesome beer super aromatic dank and citrus flavors erupt from the glass with a slitht fruity flavor. Great beer. Description: Organic two-row barley and flaked maize mashed with super soft, slow sand-filtered Astoria coast range water give this beer its golden color and light body. A triple dose of Simcoe and Centennial hops for bittering, flavor and aroma gets topped off with a dry-hop dose of Calypso in the fermenter. Its highly flocculent and mildly attenuative yeast produces a malty, fruity character in the finish to balance out all those hops. Your glass is always half full with an Optimist. My Notes: A sparse creamy head top this murky black beer. The aroma of molasses, raisin and bourbon are very present and transfer nicely in the the toasted burn bourbon flavor. Great balance with the bourbon not overdone at all. A light hint of vanilla and chocolate round the full bodied beer out as its drank. Description: The name "3 Beans" is derived from the fact that three separate beans are added to this recipe. Baltic porter brewers historically used romano beans in the mash in order to boost the fermentable sugars at northern latitudes as barley and wheat were scarce at the time, while dried beans were a cheap, durable source of convertible sugar. Cacao and coffee beans are the other two exotic ingredients added for an extra nuance of flavor. This beer was an active partnership with Mast Brothers Chocolate of Brooklyn, NY and Stumptown Coffee Roasters of Portland, OR. Description: Mosaic represents the fourth year in a row that Boundary Bay has proudly presented a double-dry-hopped pale ale at the OBF. Unique to the festival, this beer gets its name from the double dose of Mosaic hops in the fermenter. A simple grain bill of premium two-row and Munich malts provides enough body to balance the high-alpha Simcoe and Citra hops. Simcoe and Citra are high in lemon, citrus, mango and tropical fruit character, with an earthy pine and some herbal characteristics, making for a complex but quaffable pale ale. The time is no 2:05 PM and we have had our first first Wooooo of the day which can only mean that I will be berated with them until the festival is over. It was nice to have two hours without them but the festival has reached the critical woooo mass and much now release the pressure or risk an all out beerfest explosion. My Notes: A medium creamy head with a dark brown, almost black color. Great balance of chocolate and coconut the chocolate is a little more present than the coconut but not overpowering. Really nice beer to drink not too sweet as you would expect I could probably drink a few of these unlike most other dessert beers. Description: This award-winning, rich, flavorful beer uses hand-toasted coconut chips and natural liquid chocolate as "dry hops." A grist of premium two-row, Munich, crystal, brown, pale chocolate and chocolate malts gives it a rich body, balanced by a low dose of Willamette hops and fermented with a clean American ale yeast so you can taste the chocolate and coconut in the finish. Get in line early for this one. My Notes: A lightly sour beer with a nice Huckleberry flavor and aroma. Nicely balanced between sweet and sour definitely a good choice for a hot day. Description: According to the brewery, most people’s first statement when tasting this beer is “Wow! It’s like drinking a sweet tart.” This award winning, amazingly tart, sour mash Berliner Weisse is tempered with the sweet essence of great Northwest huckleberries. The huckleberry aroma draws you in and the tartness makes you come back for more. Don’t miss this unique sour. While in line my eyes were drawn to a shirt for some reason I then discovered it was because it said "strip clubs" on it. 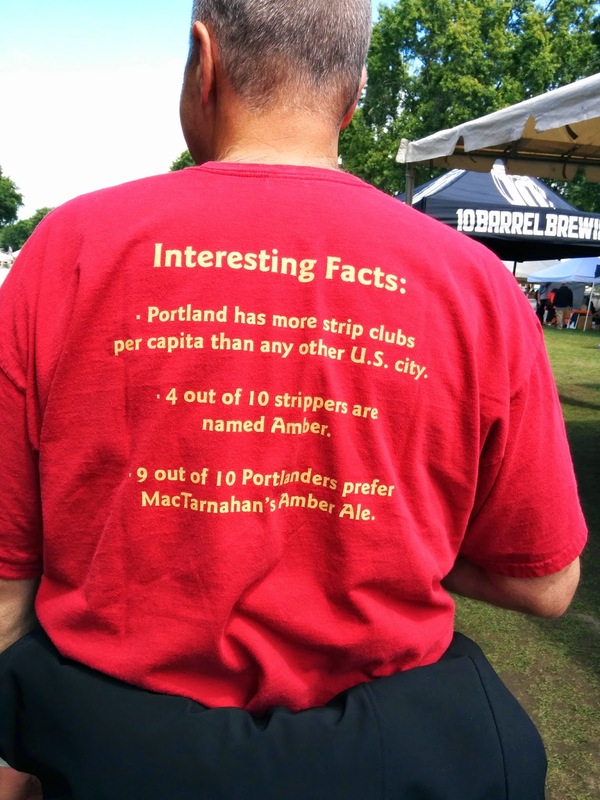 I had never seen this shirt from McTarnahans before but I am glad I did. My Notes: SUPER MALTY, moderately hopped with herbal pine flavor that could barely be found over the rich deep bread and caramel flavors. Description: If you're into maltier IPAs, this is the Imperial for you. Superior pale ale, floor-malted Maris Otter pale malt, carastan and Munich malts provide all of that amazing malt flavor, with just enough German Magnum bittering hops for balance. Four additions of Amarillo and Simcoe hops in the last 30 minutes of the boil give it hop flavor and aroma. A moderately-attenuative English ale yeast leaves some unfermented malt sugars and provides a fruity character. 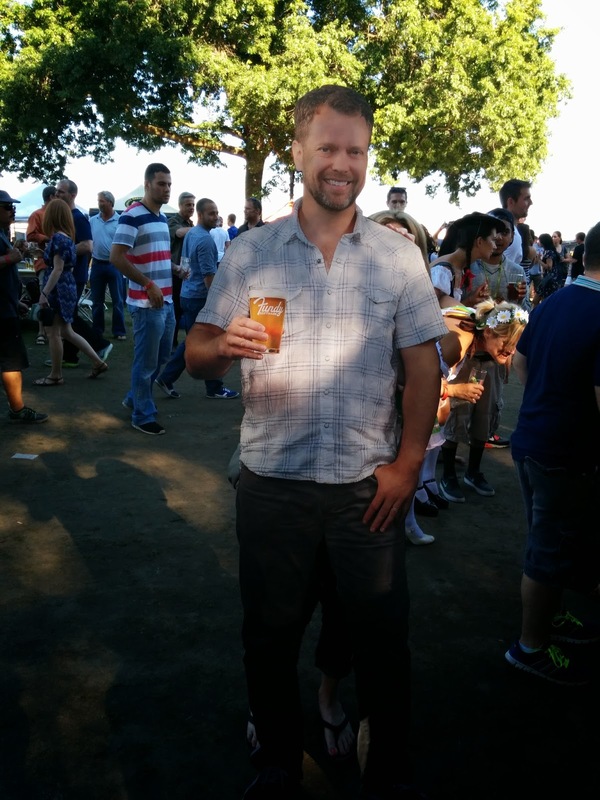 This beer is a four-time winner at the Canadian Brewing Awards in the Imperial IPA category. My Notes: A medium foamy head top this hazy golden beer. The smell is caramel and celery with a slightly herbal character. The hop flavor is of papaya and other tropical fruit. A light bodied ale with a thin texture ans soft carbonation. Description: This beer's no dog, and you won't be barking up the wrong tree if you try it. Debuted at an event that crowned Bend as "Dog Town USA," this lighthearted ale bounds with regional Citra, Centennial and Crystal hops for those citrusy notes beloved by Northwest hop hounds. Crux nudged the malt bill in the downward direction to create a sessionable ale that’s easy to love, especially in summer. My Notes: Great name for this beer it tastes like chocolate malt shake. The medium frothy head top this black ale that has cookie chocolate and coffee aromas. The flavor is toasted and chocolatey with a full body creamy texture and a sweet finish. Another great dessert beer. Description: Chocolate beer? You bet! Cacao nibs and lactose give this beer its unique, rich flavor that melds beautifully with the black, crystal, chocolate and chocolate wheat malts on top of a pale malt base. Nugget and Tettnang hops give this black, smooth beer just enough bitterness to balance. An estery American ale yeast livens up the aromas and gives it a slightly fruity character. Don't just save it for dessert, though – it might be gone by then. My Notes: Maybe because I just had Shake but this beer tasted very similar. Choclate and cookie aromas were present with a hint of vanilla and coffee. A full bodied beer with a creamy texture and soft carbonation as well as a sweet finish. Description: Brewed for Sierra Nevada's Beer Camp Across America collaborative 12-pack in collaboration with Ninkasi Brewing, this beer was inspired by the perennial café favorite. Double Latte combines two of the greatest things in life: good coffee and great beer. Oregon’s Ninkasi Brewing knows its way around a good cup of joe. Featuring cold-press coffee from the legendary Stumptown Coffee Roasters and a dose of milk sugar, this coffee milk stout is a rich and roasty treat. My Notes: My notes had got so sloppy at this time I couldn't distinguish what was made out anymore I can read citrus and tropical fruit but the rest is kind of a mess so just suffice it to say I liked this one. Description: Double Helix won the 2014 Hillsdale Brewfest, earning Concordia the right to represent McMenamins at the OBF for the third time. Chinook, Simcoe and Falconer's Flight 7C's hops add balancing bitterness and hop flavor to the complex grist of two-row, dextrapils, Munich, flaked barley, caramel Vienna and dextrose malts. A house yeast strain with a very clean flavor lets all that hop and grain complexity shine through. On Friday I went down with my work for a half work day and full brewfest day. Nothing of note happened other than I saw these people carrying around this cut out of their boss. When I asked them about it they said he goes down with them every year but he had to be away on business out of the state and couldn't make it this year. So they brought this so he could be there in spirit. The company was Fundy Software, they make photo album software for weddings, seemed like a fun place to work.